They walked through a vineyard and cut fences in the dead of night, approached the enormous white domes of the spy base and said, “In the name of Jesus Christ, we disarm you”. Then they plunged sickles into a dome, which deflated like a balloon, and they cried next to a shrine they set up. Leason, Father Peter Murnane​ and farmer Samuel Land were charged for the 2008 attack on the Waihopai spy base near Blenheim that New Zealand’s prime minister at the time, Helen Clark, called “a senseless act of criminal vandalism”. But was it senseless? As Leason says, the three men drew on a tradition of Christian pacifism and direct action. Scruffy, bearded and sometimes barefoot, they looked like Russian mystics. 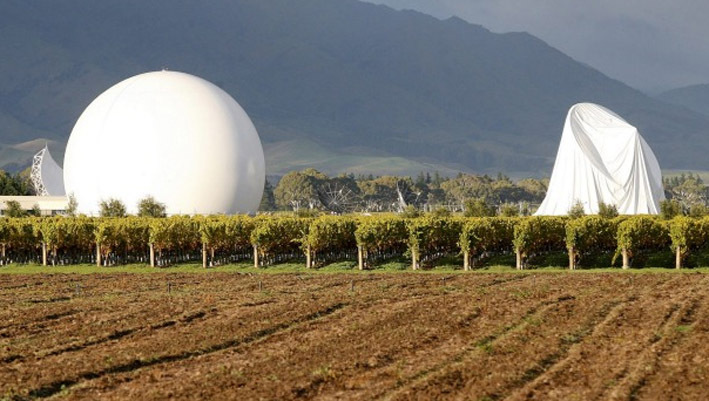 Leason is the central figure in a new documentary that spreads outwards from that incident at Waihopai to encompass the vast subject of global surveillance and New Zealand’s role in the Five Eyes alliance. At the heart of this story there is a dilemma. What do you do when the state is acting unlawfully? But it has a greater dimension in The 5th Eye because the three activists who attacked Waihopai answered to a different kind of law. It was a local manifestation of an international movement known as “Swords into Ploughshares”. Catholic radicals took their cue from a line in the Bible about destroying weapons and broke into military bases to expose or sabotage the machinery of war..
As defence lawyer Michael Knowles put it, “Every once in a while, along comes a case where law, morality and indeed humanity come together to make something lawful which would otherwise be unlawful”.